amongst operators in new regions. response to a CVV2 match request by an Issuer. arrests for Internet merchant fraud. Assistant Director, US Secret Service. 44 percent of all ‘phished’ websites. consumers, merchants and fnancial institutions. known to be linked to recognized gold farmers. performed (again without payment authorisation). transactions, can be charged and processed. consumer to use a registered credit card at your site. 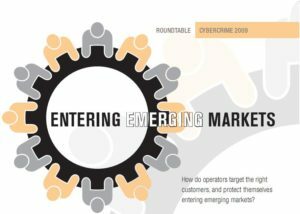 your market share in emerging markets? can vary signifcantly from one territory to another. intelligence about every territory they operate in. and in Eastern Europe the situation is improving. is not really possible to rely on third-party data. opportunities for fraudsters to exploit. customer with the address of the cardholder.